Throughout this commentary, information has been drawn wherever possible from primary sources or other contemporary documents. 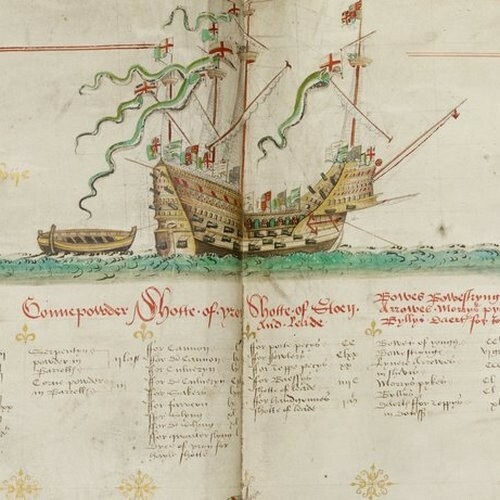 It also makes reference to recently published works on the subject, in particular ‘Tudor Warship Mary Rose’ by David McElvogue and ‘Letters from the Mary Rose’ by C.S. Knighton & David Loades. The letters were written by two of the Earl of Surrey’s sons whilst they were captains of the ship. Firstly by Edward Howard, and following his death in April 1513, by his older brother, and successor to the title of ‘High Admiral’, Thomas. This document will be familiar to followers of both the Flodden Campaign and the ship ‘Mary Rose’. Extracts from it appear in many well-known works on both subjects, but as just that, extracts. Hence these extracts often appear out of historical context and do not reflect the events to which they actually relate. Another document transcribed by the volunteers, known as the ‘Trewe Encounter’ together with Edward Hall’s contemporary chronicle both contain clues. They include the reference ‘was slain one gentleman called Morres Bakley’ [Maurice Berkley] and a party of men which had met with further hostilities the day after the battle, whilst recovering the Scots ordnance from the field. Could this be Maurice Berkley Captain of the ship ‘Mary George’? An ‘Inquisition Post Mortem’ was located at the National Archives that relates to a gentleman by this name, who was from Hampshire, an armiger, and who died on the 9th September 1513.3 That this is one and the same gentleman is also supported by John Saddler and Rosie Serdiville in their book, ‘The Battle of Flodden 1513’.4 Of course there was more than one Maurice Berkley, but for two to have died on the same day could perhaps be seen as an extreme coincidence. The ‘Inquisition Post Mortem’ has therefore been taken as evidence for the authentication and dating of the document in question. The document is an extract from the Exchequer accounts and is split into three definitive sections. The first section is written on behalf of Thomas Howard, and contains the payroll of the ships, their captains and the soldiers that travelled with him. It covers the period of 16 days from when they landed at Newcastle to when they took to the sea again. The second section of the document concerns the payments made to the ships’ captains whilst 4 days in Hull, and the third section contains the costs for the removal of ordnance from the battlefield to Berwickupon-Tweed written by a John Cragges. This section of the document, names the fifteen ships, their captains and the rates of pay for the men on board. The daily rate for a ship’s captain was 4 shillings per day, approximately £96 in today’s money.5 The mariners, gunners and soldiers all received 6 old pence per day (£12). This rate of pay was 2 pence lower than that of the soldiers that made up the Earl of Surrey’s army, who each received 8 old pence per day (£18). Further research has discovered that the ships crew were paid at an even lower rate whilst at sea. Their wages then were 5 shillings per month, (£120), which equates to approximately 4 pence (£8) per day.6 This may be due to them being ‘fed and watered’ whilst aboard ship. Evidence has been found of payments to ships of 5 shillings per head for victuals. The 4 shillings (£96.75) paid per jacket for the soldiers is the same as that recorded in the ‘Bensted’ document from 1512. These earlier jackets were described as being ‘grene and white’ in colour. The wage accounts give a collective number of soldiers, mariners and gunners detailed by ship. Douglas McElvogue in his book ‘Tudor Warship The Mary Rose’, explains the different classifications. At least half of the crew were classed as mariners. The core of these men would have been professional seamen drawn from coastal towns and villages... Landsmen driven to a career at sea by poverty or famine would have made up numbers. The management of these men would have been the charge of a Master Gunner, who would have been regarded as a senior officer in rank. Dedshares or ‘Dead pay’ was essentially a means by which officers’ remuneration was supplemented to pay for food etc., for non-crew members. Douglas McElvogue explains that the ship’s captain and senior officers also travelled with retinue of private servants, as may be the case with the ‘Sabien’ above. This rather complicates the calculation of the true number of persons aboard each ship, as the document only accounts for the fighting personnel. In addition to the regular crew of the Mary Rose, the wages of 12 Danish Gunners are accounted for within the document. ‘The Letters from the Mary Rose’ refer to these gunners being taken from a ‘hulk’ in Danzig, so perhaps they weren’t Danish after all but Polish? In the 16th century a ‘hulk’, was a Northern European, but not English, ‘Merchantman’ vessel. The average daily rate of pay for these ‘foreign’ soldiers is not clear, as the total cost of £13, 6s 8d (£6,450.27), included compensation for seven who were injured. Were they recruited for this particular campaign for their expertise with heavy guns? The reference to compensation paid to those who were hurt, would suggest they were given a dangerous job. Another document contains a further reference to the payment of compensation, for a gunner aboard the Mary Rose by the name of Andrew Fyshe, ‘to heal him of his hurts’, which amounted to 13s 4d (£322).10 Whether this document relates to the Flodden campaign is not known, but it does serve as an indication that compensation was paid to the injured, and at what rate. The total number of fighting men that landed with Thomas Howard’s Company was 1,253 Soldiers, Gunners & Mariners, plus 15 known captains and Thomas Howard himself making a grand total of 1,269. If there were in fact 11 men on the Marlyon, rather than the 10 listed in the accounts, this would take the total to 1,270. However, total numbers aboard the ships may well have been higher if private retinues of captains and senior officers, unaccounted for in this document, had travelled with them. Another possibility for the ships being moored in Hull, was the atrocious weather conditions that prevailed at the time. Evidence for this is contained within Edward Hall’s contemporary chronicle. He recounts that the Earl of Surrey wrote to the gentleman of the shires, asking them meet him in Newcastle on the 1st of September with all their retinue.16 On the 26th of August he left York for Newcastle despite weather conditions that threatened to seriously hamper the progress northwards. ...not wythstandynge that he had the fowlest daye and nyght that could be, and the ways so depe, in so much that hys guyde was almoste drouned before hym, yet he never ceased, but kept on hys jorney to geve example to them that sholde folowe. This would suggest that at this time Surrey believed his son, the Admiral to be at sea. It also provides confirmation that Newcastle was the designated destination for the ships, rather than a location further north, that has sometimes been suggested. This evidence would suggest that the ordnance accounted for by John Cragges is English. Further support for this hypothesis is contained in a letter dated the 20th September from the Bishop of Durham to Cardinal Wolsey. The Bishop reports that the Scottish Ordnance had been taken to, and remained at Etal, awaiting removal to Berwick at the time the letter was written.20 Etal Castle still bears the scar today where stone was removed to facilitate entry of such large cannons. John Cragges account states the ordnance in his care came to Berwick straight from the field of battle, which again supports the theory that it was English in origin. The whole process took 40 days from the outset to reaching home. John Cragges accounts for his own costs at 8 pence per day (£16), which is in line with the contemporary accounts of the wages paid to other land based soldiers. The grand total for the entire operation amounted to just £5 17s, or £2,830 in today’s money. As was the case documented in 1512 in the war against France, the fifteen ships that sailed into the Tyne in 1513 were not all owned by the King. Historically, in the time of Henry VIII’s father, it was policy to fund merchant ships that could be brought into service and armed during times of conflict. At this time the concept of ‘sea battles’ with guns was also relatively new, having only been introduced the previous century. Professor David Loades tells us that ‘major sea battles were more by accident than design’.26 When Henry succeeded to the throne in 1509 he inherited a fleet consisting of just five ships. He quickly set about remedying the situation, no doubt under pressure from the ship building activities being undertaken by his brother in law James IV in Scotland. The first ships to be built for purpose were the Mary Rose and the Peter Pomegranate in 1510. The only ship left unaccounted for is ‘The Marlyon’ whose captain is unnamed in the document. It is possible that this ship was the ’Merlin’, a small ‘victualler’ rather than a fighting vessel. The ship is referred to as carrying men, rather than gunners, mariners or soldiers. The document transcribed by the volunteers was merely a list of expenses with a total of £575 19s 9d (£278,643). It was highly repetitive and could be described as pretty boring! Yet, the details it does contain form a solid platform on which to base further investigation. As with other research into historical events it often asks more questions than it answers. What was the nationality of those twelve gunners? Why were the ships four days in Hull and where and when was the Admiral reunited with his father? Was it at Bolton on the 4th of September, or earlier in Newcastle as suggested in an alternative account? Definitive answers may never be found, but the process of the document’s analysis has highlighted other records where they might be lying, just waiting to be discovered. The accounts of Philip Tylney, also undated make reference to Thomas Howard, the Admiral’s father, as Duke of Norfolk, so they too were written after 1st Feb 1514. An ‘armiger’ was a person entitled to a coat of Arms. Inquisition PM, National Archives, C 142/28/17. John Sadler & Rosie Serdiville The Battle of Flodden 1513, Stroud, 2013. The Archery Act of 1511, stated that all adult men under the age of 40 were to be trained in the use of the longbow, and to practice regularly. Douglas McElvogue, Tudor Warship Mary Rose, 2015. Referred to in the accounts of Philip Tylney. Douglas McElvogue, Tudor Warship Mary Rose, 2015, pp 41-42. National Archives, MS: PRO E101/56/10/3 f 179 Calendard LP I,II 3614, p 1520. C S Knighton & David Loades, Letters from The Mary Rose,Stroud, 2002. National Archives, Accounts of Richard Gough, E101/56/28. Edward Hall, Henry the VIII https://archive.org/stream/cu31924091758288#page/n147/mode/ 2up. ‘Portable matchlock firearm, heavier than a handgun and requiring support (and perhaps two individuals) in firing. C.S. Knight and David Loades, The Anthony Roll, Cambridge, 2000. Accounts of the Lord High Treasurer of Scotland’ Vol. 4 by James Balfour Paul. http:// www.forgottenbooks.com/books/ Accounts_of_the_Lord_High_Treasurer_of_Scotland_v4_100076314; David H Caldwell How Well Prepared was James IV to Fight by Land and Sea in 1513. pp60-62. William Bawme could be the William Pawne referred to in ‘Benstead’ accounts, which although the previous year he may still have been in office. Original source may be within the Lambeth Manuscripts. 306, f. 204. John Scott, A History of Berwick, 1888, pp 108-110. It is believed the ordnance was stored at ‘Walls Green’ before being shipped from Maison Dieu to the Tower of London. The Islands referred to here would be the Farne Islands; A ‘crayer’ amongst other things, was used for provisioning ships and were small one masted vessels. Prest money was advanced to men enlisting in the British army or navy. British History Online, Augm. Misc.Book 315.R.O. f19-23 King’s ships:... Swallowe (Th. Danby, capt). Sir Edward Echyngham oldest son of John Echyngham of Barsham became a distinguished commander both on land and sea. Knighted at Flodden.